In this hands-on webcast presented by Jennifer Murphy, author of Developing with Google+, we will explore the Google+ platform and walk through the Google+ History API. What is the Google+ History API? 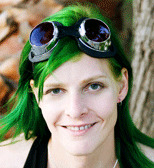 Jenny is a Developer Programs Engineer on Google+. Previously, she worked in a wide variety of software engineering roles from robotics at NASA to the architect of a social media startup. She is passionate about writing and education, especially on the subjects of technology and science.